This rhodium plated Celtic cross necklace features embossed knot-work along with oxidized accents and a polished dome of Irish Connemara marble in the center. The heavyweight Celtic cross pendant measures 1” wide x 1 1/2” tall, including the jump ring and the chain bail, and it includes a 20” long rhodium plated chain with a 2 1/2" extender and a lobster claw catch. The chain also features a tiny tassel on the end. This large piece of Irish jewelry is gift boxed with Celtic cross and Celtic knot history cards, along with a Connemara marble history card, complements of The Irish Gift House. 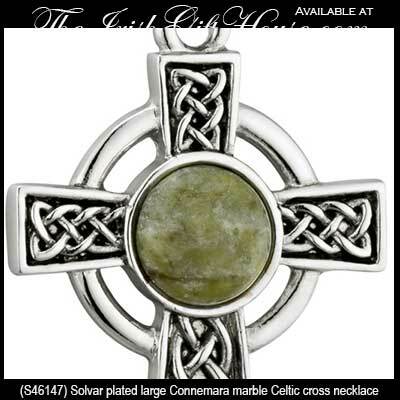 This plated Celtic cross necklace is part of the Tara Collection from Solvar Jewelry; is made in Dublin, Ireland. Large Celtic cross necklace is plated in rhodium and features knot-work along with oxidized and rose gold plated accents. 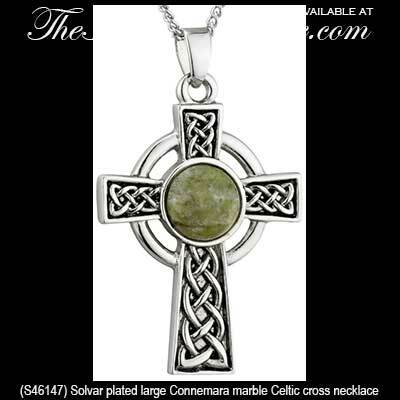 Celtic cross is a plated design that features inlaid Connemara marble in the arms; the large necklace would be a suitable size for a man.